I tried Frisbee golf many years ago and I was surprised at how lousy I was. How does a Frisbee go backwards? I knew I wasn’t very good at throwing a Frisbee, but that was ridicules. Plus, I found every tree on the course. 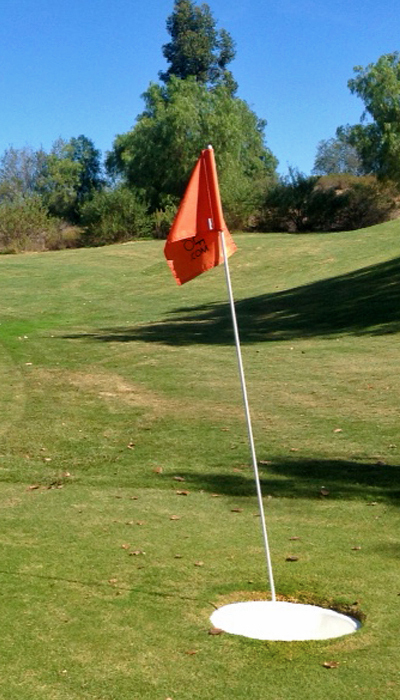 Now, there is a new activity that can be played on a golf course called Foot Golf. I can see no possible way that I could kick a ball backwards. 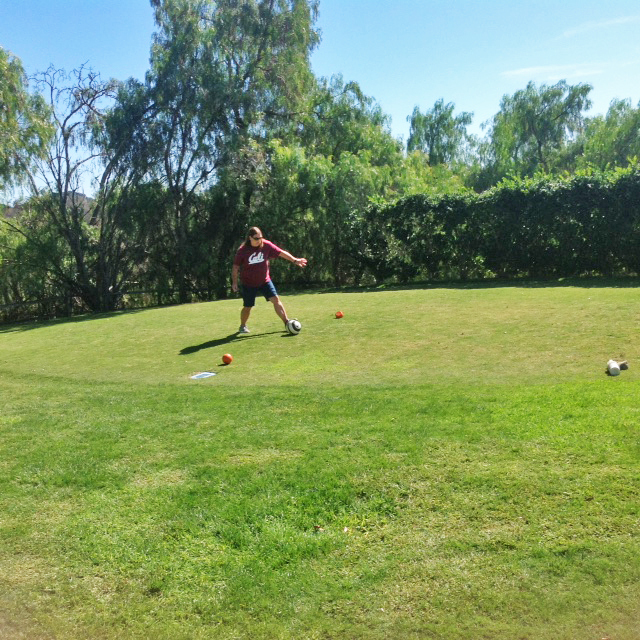 Foot golf is the combination of golf and soccer. You basically use a soccer ball and kick the ball from designated tees to the marked hole. In our case it was orange tees to an orange flag. You play on the same fairway as the regular golfers but the holes are to the side of the putting green and a little shorter as the soccer ball doesn’t travel as far. You actually hit the ball into a large white bucket that is sunken into the ground; it looks just like a golf hole, but bigger! At 21” in diameter, it gives you plenty of room to sink your putts. 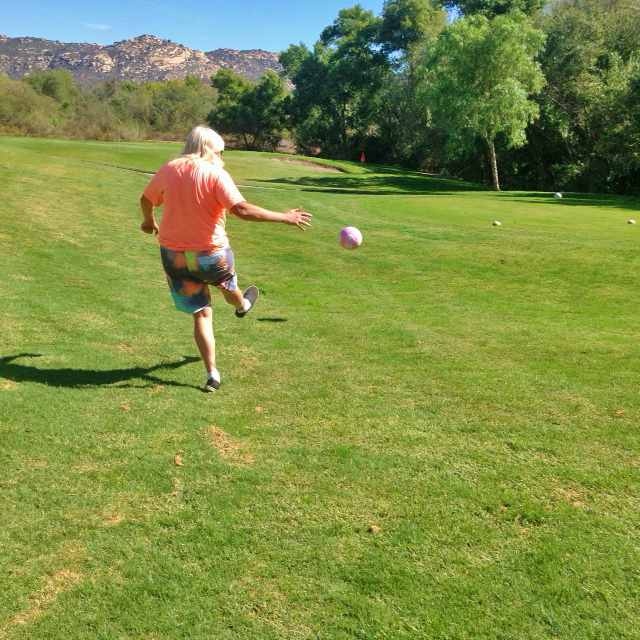 The same rules of etiquette apply to foot golf and on most courses you do play alongside the golfers. 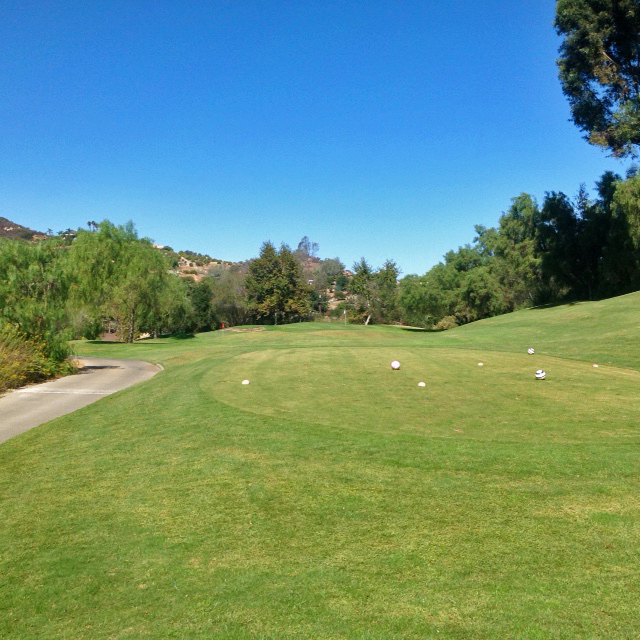 We had the pleasure of playing at Reidy Creek Golf Course in Escondido California on a warm October day. 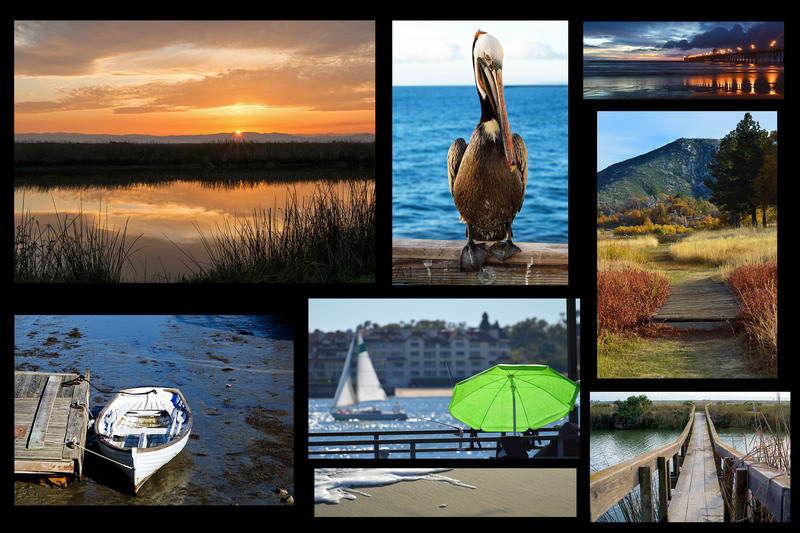 It is one of about 6 courses that offer it in San Diego County. We had a brief instruction at the check-in desk by one of the many friendly employees at Reidy Creek. We didn’t feel intimidated at all, considering we were fifty-year old plus woman trying this for the first time. A few in our group had never even been on a golf course. As usual, Staycationer JoJo found us yet another new activity to try that she found from her trusty Groupon page. Keeping us young!!!! With instructions on where to go and what to look for, we excitedly walked to the first tee! I was asked to be the guinea pig and start us off with the first kick. It has been years since I kicked any ball at all. The vision in my head was of me doing a Charlie Brown type kick and totally missing the ball while flipping up in the air. Luckily that didn’t happen. I actually felt like I kicked the ball quite solidly. As I stood there waiting to admire how far it went, to my surprise it really didn’t go that far at all. Inside, I kind of got embarrassed thinking, “Is that all I got?” My friends didn’t do much better so we all came to the conclusion that once the ball hit the thicker grass, it actually slowed down, yeah that’s it. 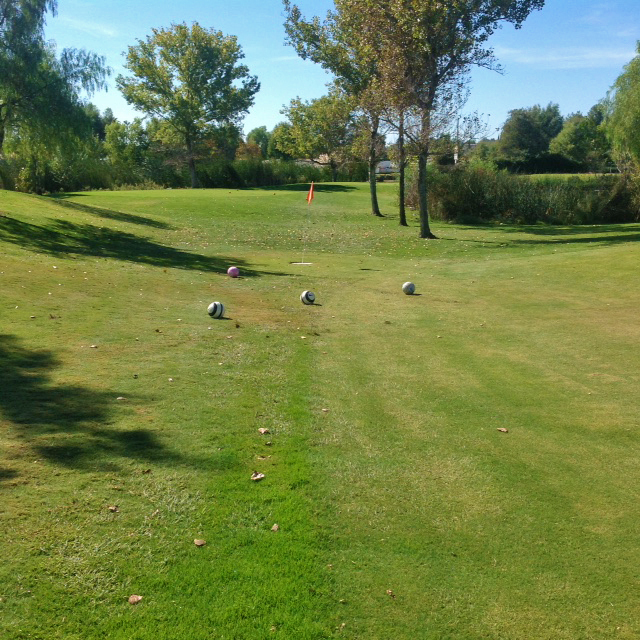 Our soccer balls lined up ready to hit our second shot on this long Par 4. 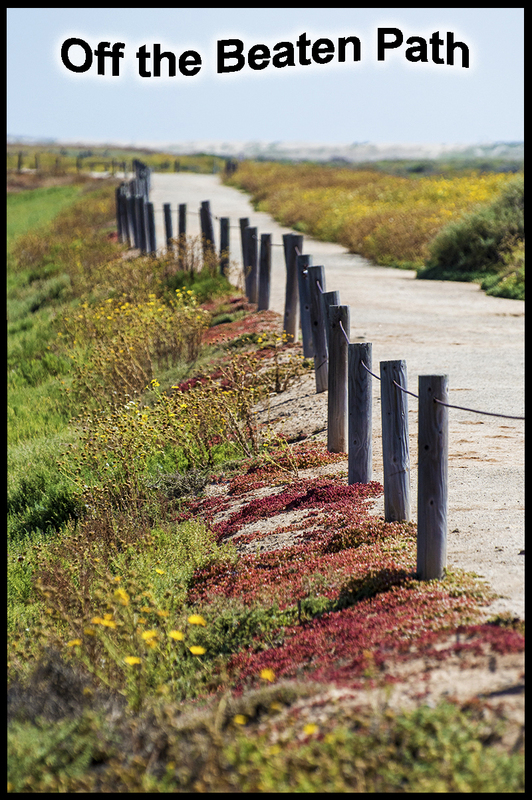 Along the way you are faced with some challenges such as sand traps, sloped fairways, reeds, and other obstacles. The course had different elevations which also added to the challenge. Don’t even ask me how to kick it out of a sand trap! I did try to kick over one and came under the ball just like a lofted golf club to give it some height. It actually worked, except as usual no distance, so of course it flopped right in the sand. That trap had a huge lip and I would have loved to see how the good foot golfers get out of that situation. In my case, I opted to pull it out of the sand and place it on a nice cushiony piece of grass. We weren’t keeping score so who cared. 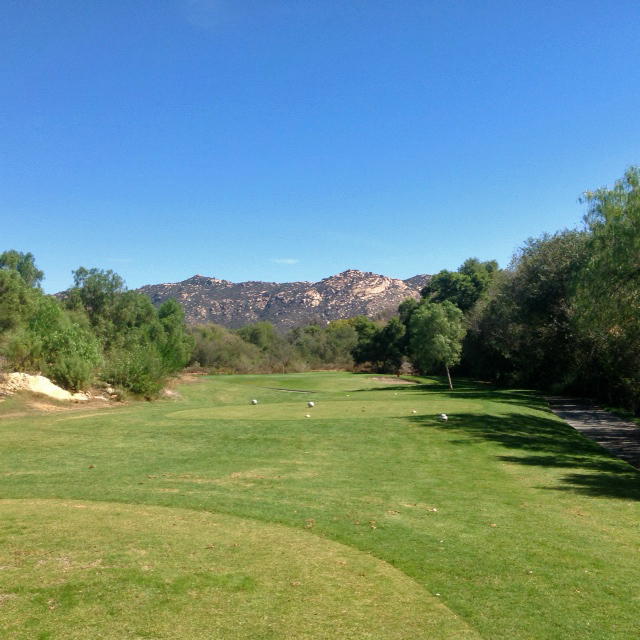 The beautiful Reidy Creek Golf Course nestled in a valley in Escondido, California. The course plays just like golf where you have to shoot for par, on this course they were par threes and fours. As we played on, we started to get the hang of it and established a kicking pattern. After more holes, we learned how to play the slopes especially when putting. We figured out how hard to hit at a given length and if we were going to hit side foot or straight on. It is actually a very fun game! We weren’t good by any means but you saw us improve over the course of the game and I am sure we would get better if we did it again. As with Frisbee golf, this sport has advanced enthusiasts that compete in leagues and tournaments, etc. I would love to watch them play one time, now that I have tried it myself. 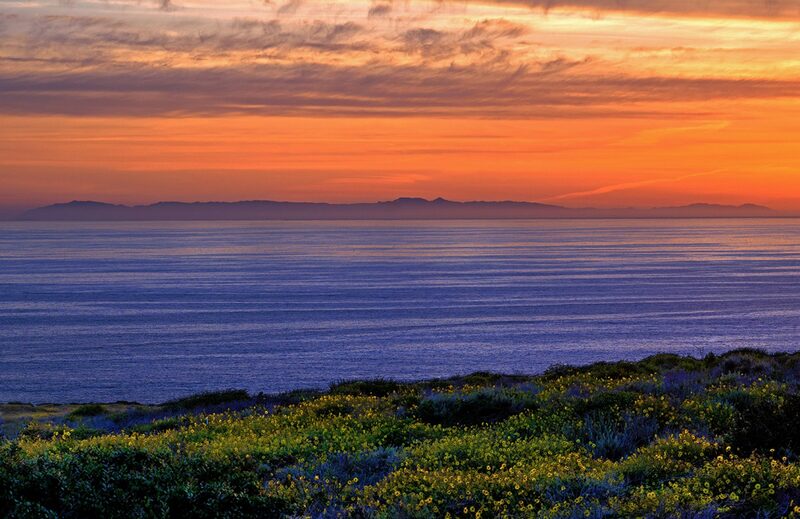 So what could be better? You’re outside on a beautiful course, with friends, laughter, getting exercise, and kicking a ball around like we used to do as kids. Two thumbs up to Reidy Creek for setting this up. Oops didn’t see this. I will add it up on the page. Thanks for the comment. Check out this really fun and upcoming sport on the links provided above.